I recently spoke and performed at Dub Net Biz networking event. It’s a laid back evening with a reputation for being fun, open and worthwhile. I ate a balloon. See the montage at the bottom of the page by photographer David McAuley. On their own, these markets are relatively quiet. But all together they keep me busy. First – I have the brand of “Brian Daly – Magician” and my products are all of the above, each with it’s own website and list of benefits to that particular market. I pitch different products to each market. Second – I appeal to all market places during my show. 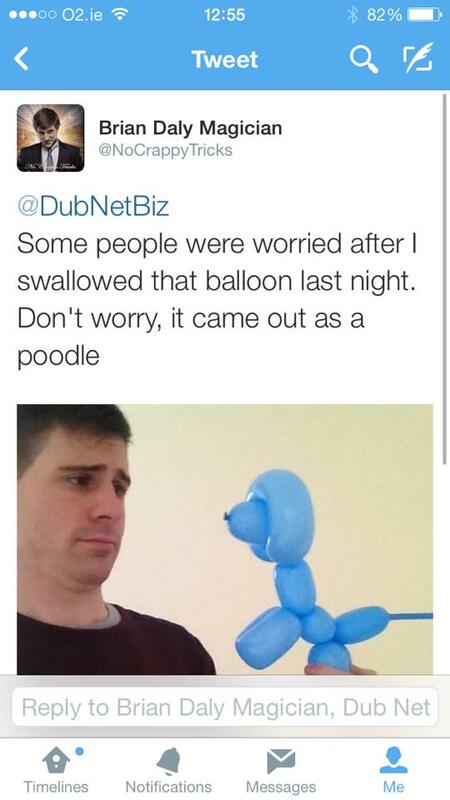 (By swallowing balloons). For example: I was asked to speak at Dub Net Biz after Angela saw me perform at a kids party, which she booked me for after seeing me perform at a christening. From performing at a christening, to entertaining a room full of knowledgeable business people is only a big leap if I fail to entertain the adults. So during my kids party show, I keep the adults laughing, and make sure the tricks appeal to all ages, and have stories of how “I was doing this last week at a wedding and bla bla bla…” which let’s the adults know I do weddings. It’s simple. It’s working. Paul O’Callaghan from EvoFitness Who spoke about his business goals, which he openly shares to help make them reality and put them out there. The Dublin legend Louis Copeland Told the story of how he started out and the level of hard work he had to put in as an apprentice. Sharing her personal and business story next was Linda O’Leary from Health Life Balance who told how she lost 10 stone the healthy way, and kept it off. And how she turned her personal experience into a business. Bobby Kerr from newstalk and TV’s Dragon’s Den Spoke about his upcoming projects, how he believes in the future of employment there’ll be no more “Jobs for life” but instead – pay as you need them- type workers. And how he’s been getting up at 5am for the past 20 years. His success is no accident. Next there was a funny and informative presentation from Sean Reid of the National Leprechaun Museum. He explained their use of social media very concisely and how they turn visitors into people who will rave about their business to others.